We can talk all day about craft–character development, narrative tension, dramatic irony, visual motifs, conflicts both intimate and social–and don’t worry, I’ll touch on pretty much all of that during this post, both positive and negative. 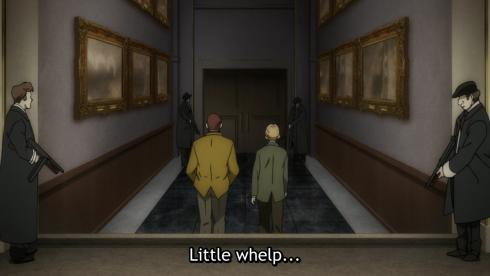 First, though, because I tend to get excited about all the analytical stuff and forget to mention the personal stuff, can I just take a moment to say how incredibly start-to-finish entertaining I find this show every week? It’s a totally personal thing, I know, which makes it hard to write about and not all that valuable to others when it comes to recommendations. 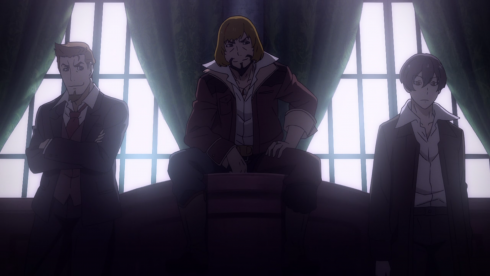 But as I went through my episode notes and found comments like “Nero is so chill ❤ I LOVE HIM” and “WHOA ANGELO WHAAAT” snuggled up next to “old guard vs new guard” and “this ep is all about food (decadence/gluttony? ),” I realized that I am 100% fully invested in this story, not just as a blogger but as a fan, too. And, a few pulpy over-indulgences and weak characters aside, that’s a seriously great place to be halfway through a series. As for the story itself, Angelo proves he’s getting better at this whole scheming business, as he hatches a plot to take down Don Orco and keep Team Nero in Fango’s good graces. 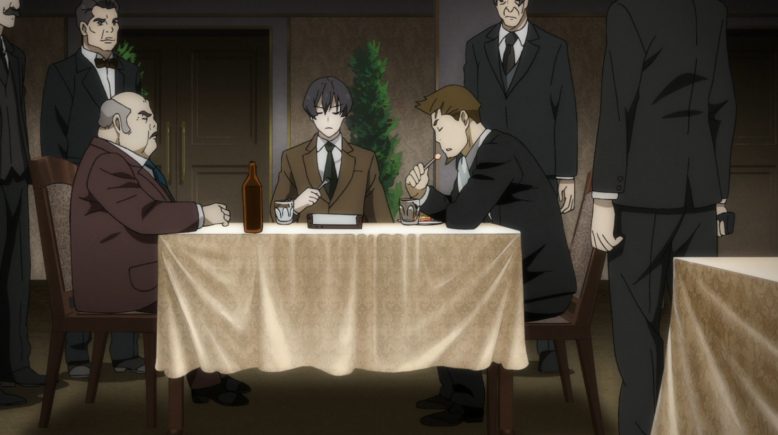 91 Days smartly tells us there is a plan but doesn’t tell us what it is, which gives every twist extra tension and uncertainty. 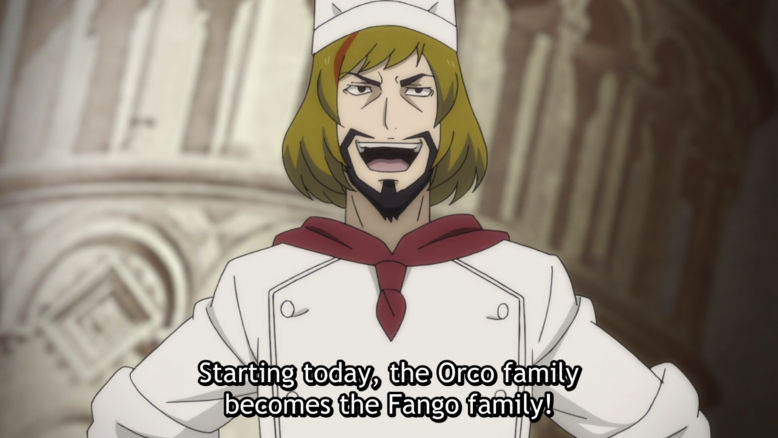 When Angelo offers to work for Orco and gives him his real name and history, it is, for a moment, completely believable that he’s decided this is the best way to exact his revenge. 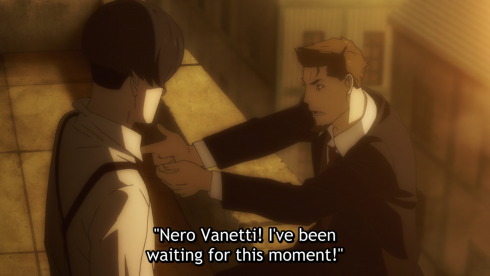 Once Nero gets shot it’s pretty obvious this is a trick, but for a long stretch of the episode we at home have no idea where this is going or if it’s even part of the plan. Alfred Hitchcock has a famous quote about the difference between suspense and surprise, which basically boils down to how much the audience knows. Surprise is an exploding bomb; suspense is a ticking bomb. 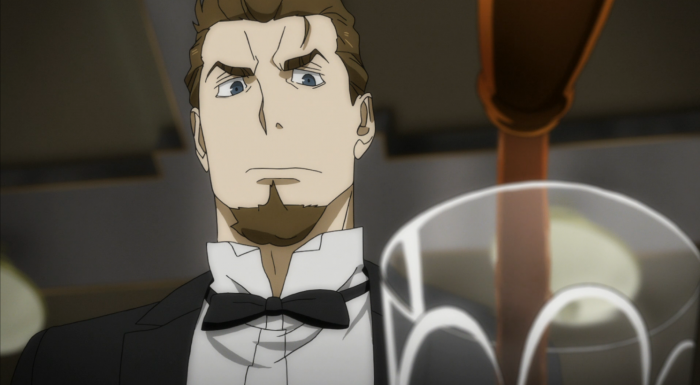 91 Days deftly balances both narrative tactics this week: To use Hitchcock’s own metaphor, we know there’s at least one bomb in the room, but we don’t know how many, where it is, when it’s supposed to go off, how to disarm it, or even how many of the other characters know it’s there. Not only does it draw us in as active participants of the game trying to guess the next move, but it also helps create empathy between the audience and the characters since we now know how they feel–forever on their toes, unsure who to trust, playing it cool even as their hands sit lightly on their guns. Nero and Angelo calmly eating dinner while armed men surround them. That’s it. That’s the show. While the central plot focused on feeding people lies, our individual scenes focused on feeding them in a more literal sense (segues!). 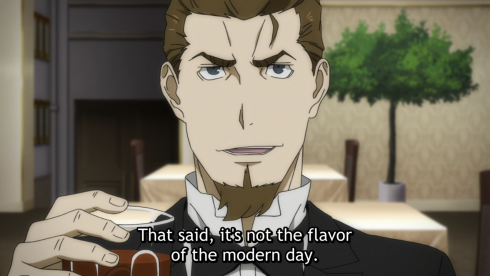 Food and drink have always been important aspects of the 91 Days universe, frequently used to highlight the relationship between factions or individuals (from fights over booze to Nero and Angelo getting paid in candy for entertaining kids), but this week they’re worked into almost every scene and frequently tied to character development. 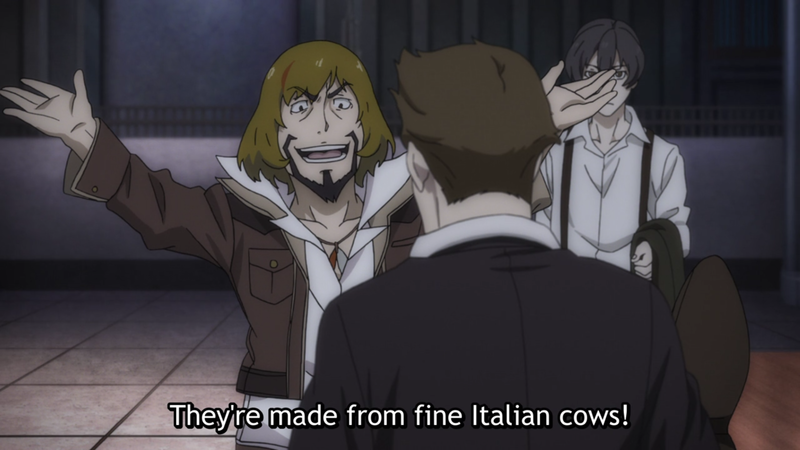 Whether it’s Nero earning Fango’s respect by trying to take a bite out of the “fine Italian cow” boots instead of passively licking them, Don Orco’s gluttony serving as his downfall, the contrasting dinner scenes of horror and camaraderie that finish the episode, or simply the way each character consumes their meal–Orco greedily shoveling steaks into his mouth, Nero relishing each bite or sip, Angelo impassive, food a means of survival rather something to enjoy–all of it tells us small but important things about each member of our cast, fleshing them out and maybe hinting at their fates, too. 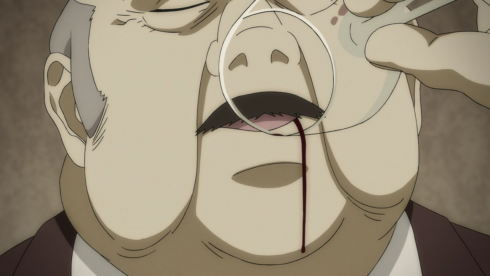 In addition to revealing character, the running food-and-drink motif also helps forward a conflict that’s been slowly burning since the second episode: The tension between the old generation and the new one, and the gradual shift of power into younger hands. Nero’s reaction to Don Orco’s “refined” aged whiskey is about as perfect a metaphor as you can get, as he acknowledges its worth before promptly declaring it outdated, dumping it out on the table, and replacing it with a plain flask of brand-new, local brew. Even Orco admits it’s top-notch–and as soon as he does, he’s all but declared himself obsolete, doomed to fall like his own decadent tastes and be replaced by someone new, unrefined, and brutally effective. Human history is basically an ongoing conflict between the older and younger generations, but every few decades there’s a landmark shift, when “the traditional” fully gives way to “the new.” The 1920s were one of those decades, and the big social conflicts in 91 Days embody that. It also reflects the shifts occurring in many criminal organizations at the time, moving from the cunning backroom diplomacy of “businessmen” like Johnny Torrio to the openly bloody turf wars of Al Capone. 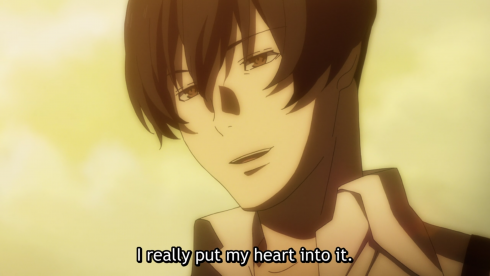 91 Days may be a work of fiction, but it’s still rooted in history (albeit a romanticized one), and captures the tensions of the times. Watching the journey this week was, I admit, a lot more fun than the destination. I’m sure you’re tired of hearing me say that Fango bores me, but it’s still true, so there it is. I don’t need the mad dog to be a well of depth, but I need him to at least be intimidating or unpredictable, and he’s just not. He’s a one-note villain who always has to cackle and vamp and be as unsubtle as possible. He turns a Hannibal-approved dinner scene that could’ve been full of creeping horror and/or dark humor into a telegraphed and over-the-top “gross-out” moment, stretching it out till it lost all impact. Which is a shame, ’cause I honestly love the gruesome poetic justice of the man who routinely abused and (I’m pretty sure) murdered cooks for their “imperfect” lasagna being cooked into one, and his associates unwittingly eating it. (Gives the phrase “you are what you eat” a whole new meaning, amirite?) Also, the image of the older generation literally devouring its own? 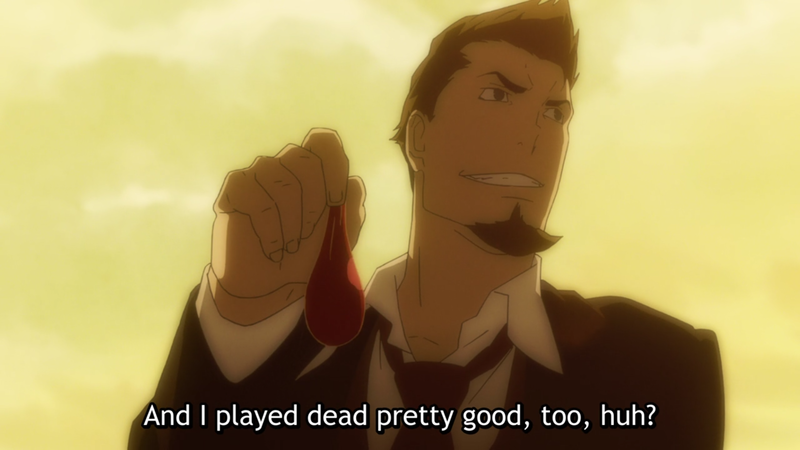 91 Days turned what I thought was just a silly running joke into a twisted punchline and metaphor, and that’s the kind of screwed-up pulpy humor I can get behind. I just wish it was executed as well in practice as it was on paper. 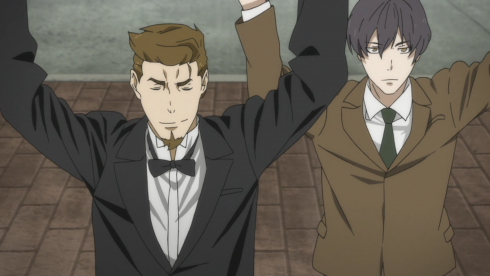 If the story of 91 Days is a struggle between the past and the future–between the old and young generations as well as Angelo’s own battle between what lies behind and before him–then maybe its narrative is a struggle between pulpy action flick and character-driven drama. It’s a pretty common mix in gangster fiction and can make for a great balance of fun, suspense, and pathos when done right. For all that I keep harping on Fango, I mostly think the series blends its two storytelling styles with admirable ease, giving me a lot to chew on after each episode even as I’m sitting there in full-on popcorn-munching fan mode while I’m watching it. We’ve still got a ways to go, and how the series keeps up this balancing act may ultimately determine if it ends up as tasty-but-forgettable crime candy or a story that sticks to your ribs. Whatever that final course winds up being, I’m going to savor every bite along the way. Any week you get to write “Aw snap, whiskey burn!” in your episode notes is a good week. I took a few screenshots solely for the dialogue, and yeesh, they really highlight how corner-cutting the animation has been as of late. Please enjoy Fango’s T-Rex arms, and let’s all hope Shuka’s just saving their good stuff for the final act. 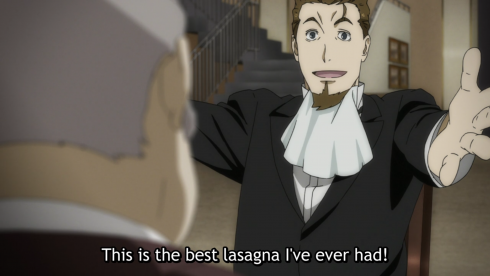 Angelo incorporating his actual history into the scheme and Nero complimenting him on his performance might be the biggest bludgeoning of dramatic irony I’ve felt in a long while. Bonus points for “I played dead pretty good” while NERO’S FORE IS LITERALLY IN SHADOWS. Ugh. It hurts and I love it.